General and restorative dentistry is dental care revolving around promoting and preserving oral health through regular checkups, therapy, occasionally surgery, and oral health good practices. This is distinct from cosmetic dentistry, which deals more with the visual condition of your mouth and teeth. At Alpha Dental, we offer several services in general dentistry. Learn more about these services below. 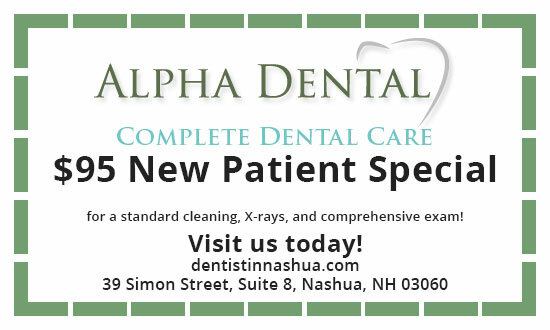 At Alpha Dental, we provide periodic cleanings and exams to help you maintain your oral health. During your cleanings and exams, our dentists and hygienists will remove plaque and calculus, polish your teeth, evaluate your mouth for any signs of oral cancer, gum disease, and tooth decay, and examine any existing dental restorations, such as crowns, fillings, and bridges. As with all of our dental services, we aim to make our cleanings and exams as pain-free as possible. Our gentle dentists and hygienists have a light touch and will do their best to keep you completely comfortable during your treatment. For more information on our pain-free cleanings and exams, please feel free to give our Nashua, NH dental office a call soon. One of the most effective and aesthetic treatment options for patients who are missing teeth is the dental implant. Dental implants are titanium posts that attach to an implant restoration, such as a crown, bridge, or denture. Several months after you have received your titanium dental implant post from an oral surgeon, you will visit our Nashua, NH practice to receive the dental implant restoration. During your appointment, our dentist will precisely and painlessly place your implant restoration for optimal functional and aesthetic results. Once the procedure is complete, dental implants will restore stability, strength, and support to your mouth and jaw. We invite you to contact our dentists today to schedule your consultation. Our dentists and dental staff will be happy to help you learn more about dental implants and dental implant restorations. At Alpha Dental, our dentists and dental team are proud of our ability to offer pain-free dental appointments. Each member of our team has gentle hands and a caring heart, which enables them to make every visit to our Nashua, NH dental practice as comfortable as possible. Our dentists and team members have been trained to deliver painless injections, so even those who are afraid of needles can rest knowing that they are in good hands. Our goal is always to make your visit here comfortable and relaxing. We want you to know that no matter what anxieties you may have, you can visit our office without fear of pain. For more information on pain-free dentistry and how we can help improve your dental experience, we invite you to contact our office soon. We aim to improve your entire oral health, which means that we are concerned about the gums, bones, and tissues that surround and support the teeth as well as the teeth themselves. We provide pain-free periodontal therapy to help prevent and treat periodontal (gum) disease. To help maintain your oral health, we offer several deep cleaning dental services, including scaling and root planing. These procedures are designed to improve your oral health and prevent the harmful effects of periodontal disease. Our dentists are dedicated to helping you maintain good oral health. For more information on periodontal therapy, periodontal disease, or pain-free dentistry, we invite you to call our Nashua and Ashby area dentists today. When a tooth’s inner nerve becomes affected by infection or decay, our dentists may recommend having root canal therapy performed to restore the tooth. At Alpha Dental, our dentists utilize electric handpieces to provide a more efficient and comfortable root canal experience. A root canal can be completed in just a single appointment at our Nashua, NH dental practice, but depending on your individual needs, you may need to return to our office on a separate occasion to receive a porcelain crown. Root canal therapy is a wonderful, pain-free option for many patients. Root canal therapy will allow you to keep your tooth and will not cause any harm to the surrounding teeth. If you are interested in learning more about root canal therapy or the benefits of pain-free dentistry, please feel free to contact our office soon. Teeth that have minor fractures or decay may receive a tooth-colored, composite filling in order to be restored to full function. The composite fillings that our dentists use can be made to match the color of your natural teeth for an aesthetic and functional treatment option. Receiving your composite filling will take just one appointment at our Nashua, NH dental office. During this appointment, the dentist will painlessly remove the tooth decay and then clean the healthy tooth structure. At this point, the composite filling is precisely placed. The entire procedure is quick and virtually pain-free. If you are interested in learning more about tooth-colored fillings or your other aesthetic, pain-free dental treatment options, please feel free to contact our office soon.